Say NO to paraffin wax candles! Every year I hesitate going to church on Holy Friday and Saturday night because everyone is holding lit white paraffin wax candles. When I was a young altar boy, it was by breathing in the toxic fumes from this type of candle during a Holy Friday service that I fell down in front of everyone and fainted, and had to be carried outside to recover consciousness. Since then I have become more sensitive to the feeling of fainting from these candles, that I am able to recover myself, but sometimes I still get the feeling decades later if I'm not holding it away from my face. From the United States Environmental Protection Agency Research and Development in the January 2001 article titled, “Candles and Incense as Potential Sources of Indoor Air Pollution: Market Analysis and Literature Review,” I learned that “most” manufacturers in the United States have agreed not to use lead in the wicks of candles. “Most” bothered me. What bothered me even more is that 34.8 percent and 13.4 percent of candles imported are from China and Hong Kong respectively where the rules and regulations do not include strict adherence to the same standards as United States candle manufacturers. That is just a nice way of saying that there are many toxic substances in candles imported from China and Hong Kong. They also go on to say that regardless of the lack of lead, burning several candles exceeded the EPA’s standards and posed an increased risk for cancer because of the acetaldehyde, formaldehyde, toluene, benzene and acrolein levels. All those chemicals, along with many others are not healthy or good for our bodies and most especially our lungs. Not only are people with asthma more susceptible to the effects of burning paraffin wax candles, but also the elderly and children. Science has proven that a child’s tiny body is negatively affected by chronic low-level lead exposure. Burning paraffin wax candles that contain lead wicks is definitely in the category of low-level lead exposure. Now I know much of this information has to do with the long term effects of using such candles, but imagine the short term harm you are still causing yourself being shut within a church full of the toxic fumes of paraffin wax candles mixed with the heavy smoke of incense. This is why there is a joke among some Orthodox around this time of year during Holy Week: "So who will be the first to burn their hair and faint in church this year?" We may not be able to prevent burnt hair, but we can prevent fainting from toxic candles. 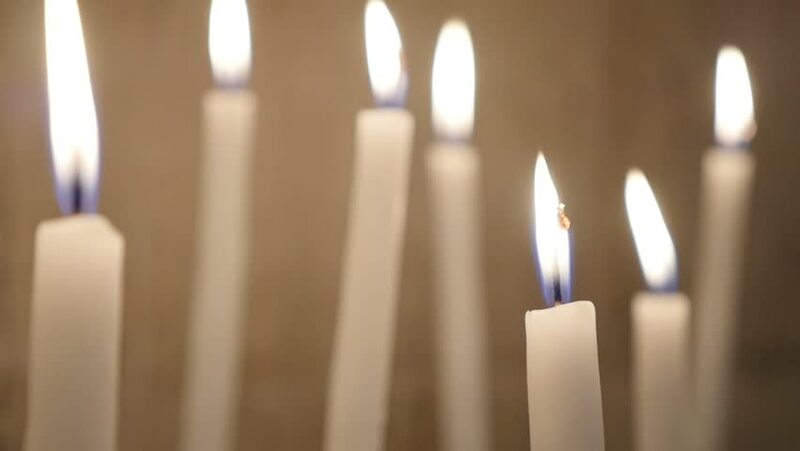 To be clear, I'm not necessarily calling for a protest by not attending these services, among the most beautiful of the church year, but clergy and parishioners need to change their habits and get rid of the paraffin candles, at least for these types of services. It would be irresponsible to not do so. Say YES to beeswax candles! As an alternative I would recommend the more traditional beeswax candles which are made by honeybees. The wax is a secretion from the glands on the underside of their abdomens and is used for the construction of the honeycomb. That’s kind of gross sounding too if you don’t like bugs, but at least it is natural and clean. Besides, there are not many things more beautiful than a honeycomb. Anyway, the beeswax candles last up to three times longer than paraffin wax candles and twice as long as soy candles of the same size. 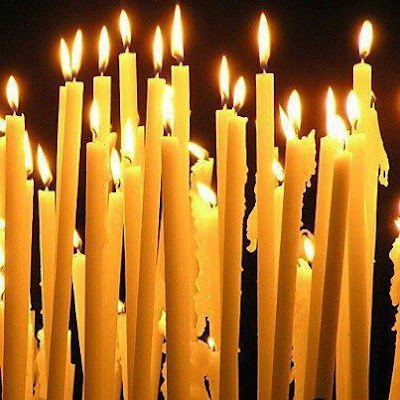 In conclusion, GET RID OF ALL PARAFFIN WAX CANDLES FOR HOLY FRIDAY AND HOLY SATURDAY! Instead, use no candles or use beeswax candles.